I am truly amazed by my episode 57 guest Amanda McDonough. She is probably the most inspirational of all the guests I've had to this point. She pushed me to try to figure out how I could ... See More talk with her, I am glad I did. Ready to be heard the book that Amanda wrote is a must read. Amanda McDonough was born in 1990 and diagnosed with hearing loss at the age of 4. As she grew older, her hearing steadily declined as she battled to hide her ongoing hearing loss from her family, friends, teachers, and the world. Despite facing unbelievable challenges, she succeeded in; getting straight A’s in school, having a successful child acting career, and leading a fairly “normal” life. McDonough currently resides in Los Angeles, California and enjoys successful inspirational speaking and acting careers. Amanda’s recent television, theater and film credits include: ABC's "Speechless," NBC’s “Bad Judge,” ABC Family’s “Switched at Birth,” Chris Lilly’s Pilot series “Just Us Guys,” "Our Town" with Tony nominated Deaf West Theater and films such as “Listen” directed by Michaela Higgins and "Silent Star" directed by Steven Sanders.. Her films "Passengers," "Loud and Clear, " and "Lady Electric" have gone on to show in various festivals (such as Cannes) and win awards. 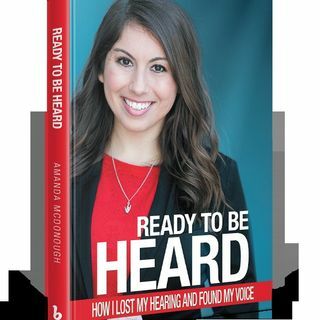 How I overcame my hearing loss, discovered who I really am, and found a balance between the hearing world I was raised in and the Deaf culture to which I now belong. How to overcome your own struggles and obstacles in life. How to live your best life with hearing loss.As well as, how to better communicate with & empathize with the people in your life currently experiencing a decrease in their hearing. (Last chapter of my book is called "The Hearing Loss Handbook" it contains tips and tricks for dealing with hearing loss.